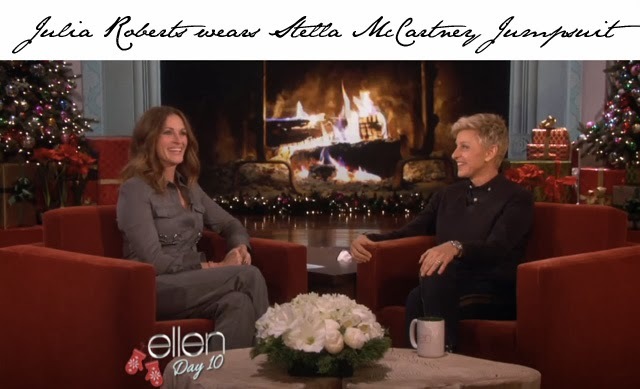 Julia Roberts acted as co-host on the Ellen Degeneres show in LA today. She also put to bed all rumors she is pregnant after appearing in a rather close cut jumpsuit. For those of you wondering where to get the jumpsuit Julia Roberts was wearing, it's a Stella McCartney Tweed Jumpsuit that we've been eyeing up all season. Let's just call it like we see it.... once again we're impressed with Roberts and her dare to wear fashion sense. Not just any woman would be brave enough to step onto television wearing one of the most difficult to pull off fashion pieces. Honestly, folks, have you ever tried a jumpsuit? They are truly one of fashion's hardest looks to wear appropriately. But we happen to think Julia Roberts' jumpsuit did nothing but fit and flatter. Props to you, Miss Roberts. Surprisingly, this is the same jumpsuit that Miley Cyrus wore as airport attire back in July of this year. And Stella McCartney herself has also worn said jumpsuit, appearing in said item to showcase her pre-fall collection last January. So, the jumpsuit's a go. Julia Roberts "jumped" and landed in the land of the fashionably favored. Here's the clip from today's Ellen Degeneres show.